6 Years and 2 Months! CET are 6 years and 2 months old! 3. I would fly to the beach....if I had to guess I bet Thomas said 1, Eli 2 and Caleb 3 because it just fits their personalities, ha! The boys sometimes have a funny way of asking for things (it can be quite frustrating for the parents). For example, they'll tell me during dinner "how am I to wipe my mouth!" Instead of just asking me for a napkin. Or "how am I going to pick blueberries!?" Instead of just asking me for a cup or bucket. Every night we ask the boys what they want to pray for and they'll usually say things like food, our friends, our hands, our home etc. Well a while back ago, sometime after the boys discovered and started asking question about homeless people. Caleb tells me that "homeless people pray for trash, no houses and for tents." His words exactly. Caleb told me the other day "mami when I was in preschool I could not do criss cross apple sauce but in kindergarten I can do criss cross apple sauce." At first I was like what the heck is criss cross apple sauce? It was then explained to me that its the more politically correct way of saying 'sitting Indian style' which is what I was thought in elementary school. Then I was like, please say it some more because it sounds so cute coming from a 5 year old! "Criss cross apple sauce!" We were heading to Burgerville and the boys were all excited about eating hamburgers and fries. In the car Eli tells me he wants to eat hamburgers and fries and I reassure him that that's what we'll get for him. When we enter the restaurant he tells me again that he wants to eat hamburgers and fries. After we order the food we sit down at a table and Eli again tells me he wants to eat hamburgers and fries. Keep in mind that since he's been alive we have only ever gotten hamburgers and fries at Burgerville. At this point I turn to him and tell him "I'm getting you asparagus and only that!" He then looks at me realizing I'm only joking, tilts his head to side and says "then I will eat nuh-sing!" On our walk home from school Eli tells me "mami George does not celebrate Christmas like us." I say, "oh really, he must be Jewish." Eli says, "no mami his name is George." Haha! Caleb has a history of telling us when he gets mad at us that he wants to leave this house and never come back. The first few times he said it it was heartbreaking and I'd tell him that that could not happen because I loved him too much and I would miss him terribly. Well after hearing one too many times I started just saying "ok then, see you later!" Well recently one morning Caleb wakes up and tells me he wants to snuggle because he had a bad dream. As we snuggle he tells me that in his dream he had gotten a new mom and dad and he tells me that he never wants that to happen. He has since to threaten me with leaving this house forever, ha! The other day Caleb tells me that he doesn't want to be a grown up because he doesn't want fake teeth. I pause to explain to Phil that I had mentioned to them that a lot of people as they get old will sometimes loose their teeth. I try to reassure Caleb that it doesn't happen to everyone. I ask him if he remembers that little old lady we visited that morning, she doesn't have any teeth but that I thought papa Ed still has all his teeth. Then Caleb says, "I don't ever want to be an old lady!" I reassure him, "Caleb I promise that you will NEVER be an old lady!" Phil was sanding some wood and wearing those work earmuffs to protect his hearing. The boys were nearby playing. Well when he was done Thomas comes over and asks if he can use the "ear muffins." "Stop licking your brothers feet!" "First let me sweep up the all salt from under the bed." "There's literally mango chunks in the electrical outlet." "Why is there underwear on the counter-top?" "He's trapped in the chair!" "My kid makes for a good foot rest." "Eli sneezed with a mouthful of chocolate." "There's a cat in my boot!" 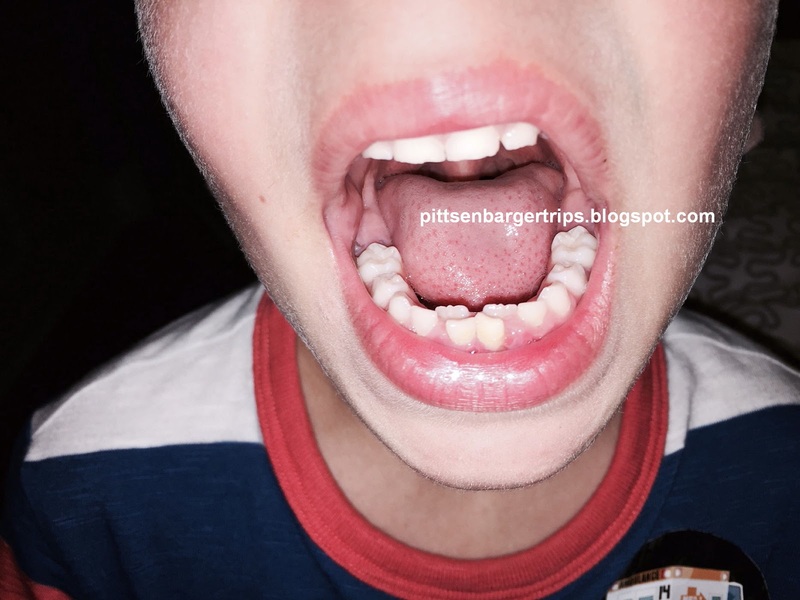 "My kids have shark teeth!" but they couldn't have come out any cuter! Gah! This park was soooo awesome! It's quite perplexing but at least they'll always have someone to play with! Phil's latest wooden master piece! The boys room is so small I can't get a good over all picture of it so this will have to do! The door is to the right. Had to rearrange a lot of their wall decor. view from the top bunk! 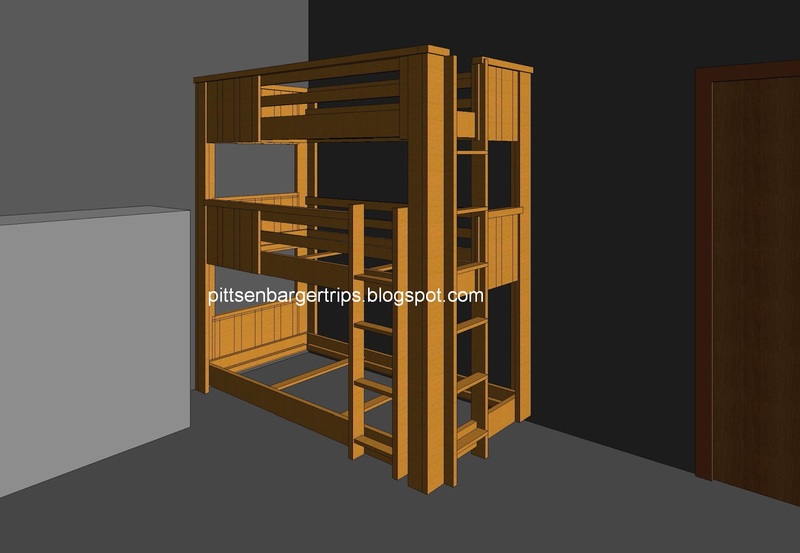 Phil took some time off of work and was able to design and build the boys triple bunk beds! They save us so much more space then their last set up. The boys have been spending a lot more time in their rooms which is nice and it keeps the whole house so much cleaner. 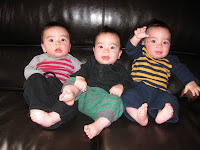 We talked to the boys before hand about who would get which bunk and after some discussion we settled on taking turns. However I had already bought the boys color specific sheets (yellow for T, blue for E and green for C) but I figured they probably wouldn't care. Well when we set up their beds I didn't think about it and just put the yellow sheets up top, blue in the middle and green at the bottom. The boys didn't even question it and went to their respective colors, ha! They are all happy were they are at but sometimes they'll spend the night in each others bunks, the last few nights Caleb has been sleeping with Thomas on the top bunk (he told me he had a bad dream). As far as I can tell this will be their beds, mattresses and sheets till they move out, money well spent! The beds should last no problem, the mattresses are under a 25 yr warranty from IKEA, and I bought quality high thread count sheets (consulted with someone about getting good sheets that will last till they are at least 18, ha!..FYI stay away from IKEA sheets they are the worst!). Follow On Facebook, never miss a post! We have been married 14 great years. We are from California but now live in Portland, Oregon. 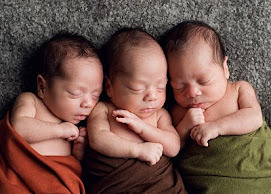 We love it here and are looking forward to raising the triplets surrounded by fresh air and beautiful green forests. Multiples are a lot of hard work but so much fun! 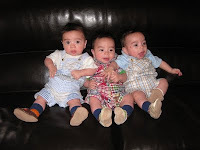 I started this blog as a way for friends and family to follow my pregnancy and the triplets once they arrived. 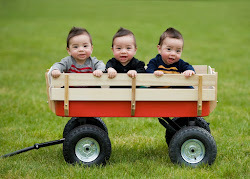 Since there is not a lot of information out there, other triplet blogs were a great resource for me when I was pregnant. 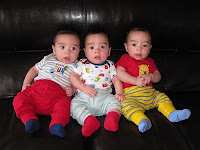 So now I also hope this blog can be of use for expectant and new triplet parents. 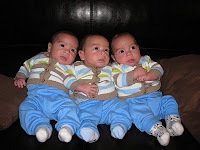 We are spontaneous identical triplets, the chances of conceiving us is guessed at anywhere from 1 in 60,000 to 1 in 200,000 (so rare they just don't know for sure). 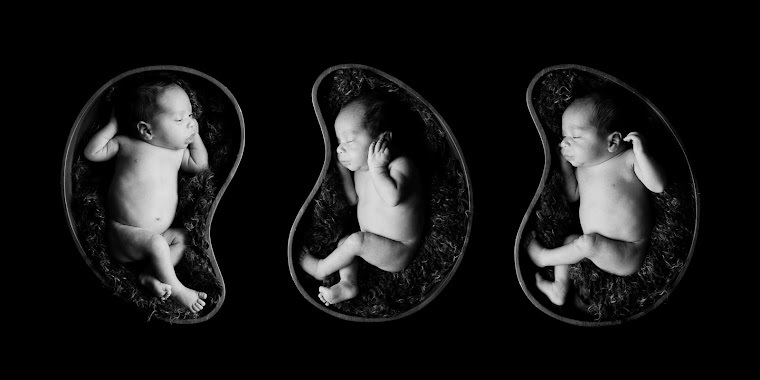 We were considered a very high risk pregnancy because we only shared one placenta but mom never spent a day in the hospital until the day we were born on 9-28-2010 at 34.0 weeks gestation. All over 4 pounds and as healthy as can be! 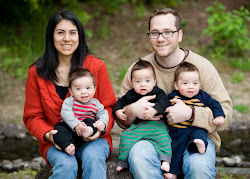 Oh yes, and we were all breastfed till the age of 2!!! 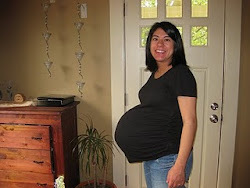 33 weeks-Looking for a sign? Last Few Days as Babies!